Gaming headsets can cost well over $70. 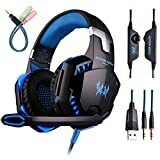 But most gamers are unaware that there are quite good gaming headsets that cost way cheaper. 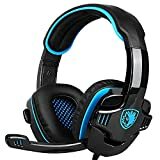 The best cheap gaming headset I found, Bengoo Stereo, only cost me a few dollars! The only thing you are missing out with budget gaming headsets is a fancy brand name, which is not at all related to performance. When I got this gaming headset for a budget price online, I wasn’t expecting much. But DLAND managed to pleasantly surprise me. Design-wise, it’s very standard. It’s not as comfortable as Bengoo, but it fits on the head adequately and is not uncomfortable to wear for prolonged periods. This headset is compatible with laptops, notebooks and smartphones too. It connects with a litz wire, which is quite sturdy and won’t break unless you pull really, really hard. The microphone on this is quite excellent. Also, the mic is very sensitive. While it’s great when talking gently, sometimes the person on the other end can hear annoying noises like breathing. The cable has buttons for the microphone, including a voice button to answer calls immediately. This is a definitely a solid investment for cash-strapped gamers. 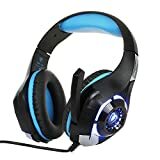 This gaming headset has stunning blue LED lights on the ear cups that light up beautifully when in use. The ear cups are covered in very soft leather that does not rub against the skin. They were so comfy to wear and did not cause any discomfort issues even after hours of gaming. Those who don’t like cushion covered ear cups will definitely like this headset. Despite the low price tag, this headset is amazingly flexible and durable. It can handle even rough use. The PVC cable wire has excellent tensile strength to last years. The headset is equipped with a 40mm driver, so the sound clarity is quite astounding. It has an excellent sound range and can deliver special sound effects, like sound of shocks, superbly. This headset is compatible with laptops, smartphones and gaming consoles like the PS4 and Xbox One. It’s practically a steal considering this level of compatibility and its price. Sades has a good reputation for making truly excellent gaming headsets. This release is no different. It has a really cool-looking exterior and very comfortable ear cups. It’s compatible with multiple devices including Macs, PS4, Xbox 360 and any Windows PC. The head pad and ear cups are cushioned with soft leather that is sweat resistant. The microphone is adjustable by 120 degrees and can be folded and hidden. Sades claims that the headset can shield electromagnetic and radio-frequency interference during gameplay. I haven’t really experienced either of these as issues, so I can’t say how effective the headset is at shielding them. Overall, the design and sound quality is quite excellent. I bought this for a discounted price so it was all worth it. The Envel G200 is the quintessential gaming headset that I purchased for a bargain price. It’s very comfortable and is designed to be worn for hours on end. The headset is very durable too, so it will survive a fall or two without a scratch. 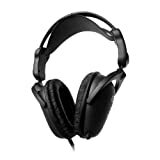 Importantly, this headset is equipped with a 50mm high precision neodymium driver. So the sound this provides is crystal clear, as if you are really in the game hearing the noises. It delivers excellent sound clarity and reproduced sound effects in an eerily realistic manner. The headset is great for noise cancellation too. My only complaint is that the earmuffs weren’t as sweat resistant as I’d hoped. This is a dirt cheap gaming headset with only the basic, necessary features. It’s not super comfortable. I’d say it’s as comfortable as those standard headsets people used back in the nineties. Audio is of medium quality. It can, however, deliver strong bass sounds. The microphone can be pulled out when needed. The ear cups are covered in soft leather that feels like shopping bag material. It’s not particularly uncomfortable, but if this is all you can afford, it will be quite adequate. When it comes down to it, great sound is what you need the most. Look for specific sound features the gaming headset you are interested in offers. Check the specs for the driver and compare with several other products before making your final decision. Comfort level matters too. You will be wearing this headset for hours while gaming. So, you would want it to be comfortable, not slip off or cause chafing. Most gaming headsets available nowadays are well padded. Make sure the padding is sweat resistant. Choose leather padding as it is the most comfortable in general. The padding should be made from breathable material to facilitate temperature regulation. There’s a debate between wired and wireless gaming headsets. Ultimately, it’s up to you to decide. 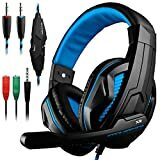 Most budget gaming headsets are wired. This is necessary to deliver great audio and record the microphone. Wireless gaming headset may not deliver audio as well as you like. Check the position of the microphone and how flexible it is. The microphone should be foldable to put it away when you don’t need it. Bendable microphones are also preferable so you can adjust it as you like when talking.